Ever since the French Revolution, Madame de Pompadour's comment, "Apres moi, le deluge" (after me, the deluge), has looked like a callous if accurate prophecy of the political cataclysms that began in 1789. But decades before the Bastille fell, French writers had used the phrase to describe a different kind of selfish recklessness - not toward the flood of revolution but, rather, toward the flood of public debt. In "Before the Deluge", Michael Sonenscher examines these fears and the responses to them, and the result is nothing less than a new way of thinking about the intellectual origins of the French Revolution. In this nightmare vision of the future, many prerevolutionary observers predicted that the pressures generated by modern war finance would set off a chain of debt defaults that would either destroy established political orders or cause a sudden lurch into despotic rule.Nor was it clear that constitutional government could keep this possibility at bay. Constitutional government might make public credit more secure, but public credit might undermine constitutional government itself. 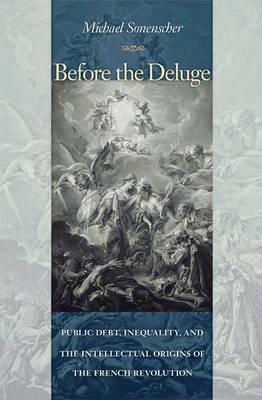 "Before the Deluge" examines how this predicament gave rise to a widespread eighteenth-century interest in figuring out how to establish and maintain representative governments able to realize the promise of public credit while avoiding its peril. By doing so, the book throws new light on a neglected aspect of modern political thought and on the French Revolution.